Get ready to do a little more math at the end of your meal. 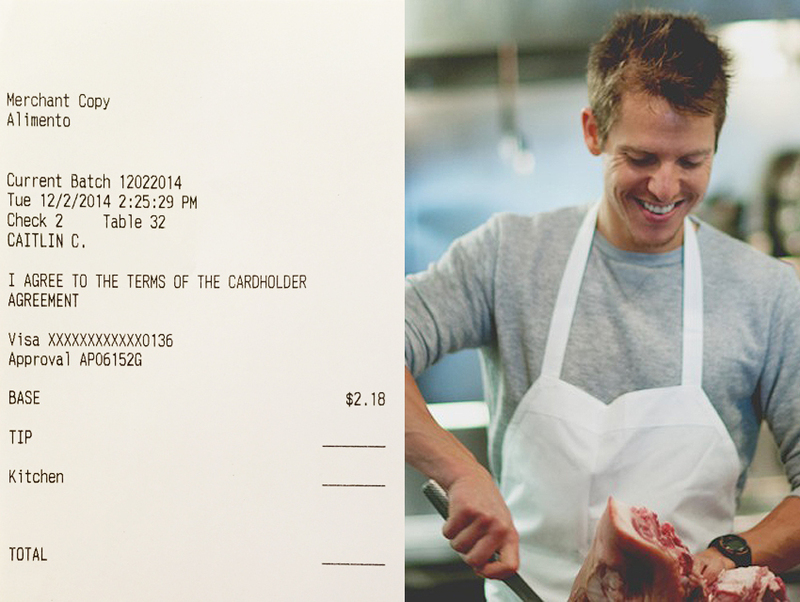 Starting tonight, Silver Lake’s Alimento will institute a separate line on all checks for kitchen gratuity—the first of its kind in the nation, as far as we can tell. “At Alimento, we believe a great meal comes together not from the effort of any single person, but from the successful cooperation of a team of people, from servers and hosts, to cooks and bussers. Nevertheless, traditional tipping has created a very sizeable gap between the earnings of cooks and servers, and current State law prohibits restaurants from sharing servers’ tips with kitchen staff. “Rather than imposing a mandatory ‘service fee’ or ‘kitchen surcharge’ as many are doing, we’d like to leave the choice in your, the diner’s, hands. If you’re perfectly happy with tipping as usual, there’s no need for you to do anything differently. But, if you’d like to send a little love to the lads and ladies hustling in the back, we’d be honored to provide you the means to do so. All such tips will go to line cooks and other kitchen staff; no one in management will participate. L.A. has many great restaurants, and we’re thrilled you’ve chosen to dine with us today. We will continue to work hard to bring you the best dining experience we possibly can. We plan to follow up and see what the early reaction is from diners and staff. For now, we’re just glad our phones come with calculators.